A thermistor, whose resistance value varies according to the ect, is built into the engine coolant temperature (ect) sensor. 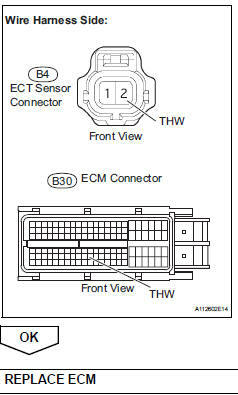 The structure of the sensor and its connection to the ecm are the same as those of the intake air temperature (iat) sensor. When any of dtcs p0115, p0117 and p0118 are set, the ecm enters fail-safe mode. During fail-safe mode, the ect is estimated to be 80°c (176°f) by the ecm. Fail-safe mode continues until a pass condition is detected. When any of these dtcs are set, check the ect by selecting the following menu items on the intelligent tester: diagnosis / enhanced obd ii / data list / primary / coolant temp. 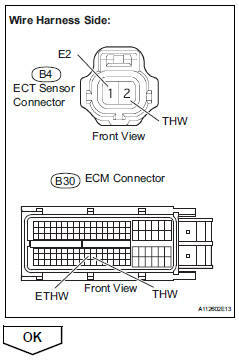 The engine coolant temperature (ect) sensor is used to monitor the ect. 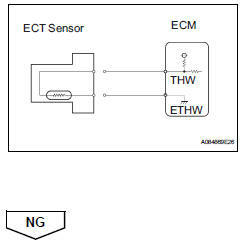 The ect sensor has a thermistor with a resistance that varies according to the temperature of the engine coolant. When the coolant temperature is low, the resistance in the thermistor increases. When the temperature is high, the resistance drops. These variations in resistance are reflected in the output voltage from the sensor. 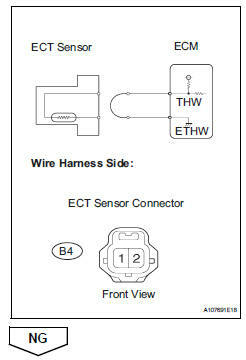 The ecm monitors the sensor voltage and uses this value to calculate the ect. When the sensor output voltage deviates from the normal operating range, the ecm interprets this as a fault in the ect sensor and sets a dtc. Example: if the sensor output voltage is more than 4.91 V for 0.5 Seconds or more, the ecm determines that there is an open in the ect sensor circuit, and sets dtc p0118. Conversely, if the voltage output is less than 0.14 V for 0.5 Seconds or more, the ecm determines that there is a short in the sensor circuit, and sets dtc p0117. If the malfunction is not repaired successfully, a dtc is set 0.5 Seconds after the engine is next started. Read freeze frame data using the intelligent tester. Freeze frame data records the engine condition when malfunctions are detected. When troubleshooting, freeze frame data can help determine if the vehicle was moving or stationary, if the engine was warmed up or not, if the air-fuel ratio was lean or rich, and other data, from the time the malfunction occurred. Read the value displayed on the tester. Standard value: between 80°c and 100°c (167°f and 212°f) with warm engine. If there is an open circuit, the intelligent tester indicates -40°c (-40°f). If there is a short circuit, the intelligent tester indicates 140°c (284°f) or higher. Disconnect the b4 engine coolant temperature (ect) sensor connector. Connect terminals 1 and 2 of the ect sensor connector on the wire harness side. Standard value: 140°c (284°f) or higher. Reconnect the ect sensor connector. Disconnect the b4 ect sensor connector.